At the halfway stage of the season, the top three teams in the Readers Lincolnshire ECB Premier League have opened up a 19-point gap over the chasing pack. Leaders Bracebridge Heath - going for their third successive championship and their 11th overall - have a 16-point lead over Grantham in second, who have a six point advantage over third-placed Bourne. Woodhall Spa stay fourth despite losing a tight game to Grantham, with Lindum fifth. But below them just six points separate the next five teams, Alford leading the pack on 111 and Grimsby and Market Deeping just above the relegation zone on 105 each. Louth’s defeat to Lindum puts them back into danger in 11th place, just eight points up on bottom placed Spalding. At Jubilee Park, it took a bowling change before the first wicket fell. Woodhall had 76 on the board by the time Neil Stevenson struck to dismiss Pradeep Chanditha for 32, and the bowler went on to dismiss all of Woodhall’s top four. James Keast joined the attack to take the next four and the home side were all out for 171 in the 46th over. Grantham quickly found themselves 10 for two then 54 for three but the middle order came to the rescue, pushing up the score as wickets continued to fall. At 135 for seven it was still anyone’s game, but Keast put on 29 with Sammy Peters and was then joined by Stevenson to take Grantham to a two-wicket win in the 51st over, Keast ending 46 not out. A captain’s innings of 52 from Charlie Tomlinson helped Lindum to 151 for nine after his side had found runs hard to come by at home to Louth, who found things equally difficult against the bowling of James Kimber and Jonny Miller and were all out for 136. Boston picked up much-needed points against Grimsby, recovering from a slow start to make 241 for eight, Ricky Lovelace with 62 and Daniel Sincuba hitting 55 in a third wicket stand of 101. Tom Baxter chipped in at the end of the innings with 41 off 26 balls while, for Grimsby, Jack Nilsson took four wickets. The visitors then set off well, putting 92 on the board before a change of bowling saw Paul Deans dismiss Steve Crossley for 54. 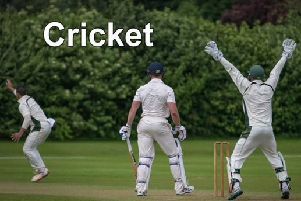 However, by the time Neal Snell went for 46, Grimsby were 112 for five and four wickets for Fayadh Haffejee for just 13 runs saw the final wicket fall on 121, Jonny Cheer taking four very good catches. After losing a wicket with no runs scored at Alford, Bracebridge again hit the day’s highest total of 247 for eight, David Whapplington (68) and Kit Spence (54) sharing a second wicket stand of 144. Both fell to Ricki Bovey while Nick Bennett took five wickets. Alford lost their first three wickets for 15 runs then the two Matthews - Bradley and Carter - joined forces to keep the run rate down and take three and four wickets respectively as the home side were all out for 110. Tight bowling from Bourne restricted Sleaford to 171 for nine, Jack Berry taking four wickets before going out to open and getting his side off to a good start with 32. Fellow opener Jordan Temple went on to make 46 and with three wickets down, Pete Morgan and Carl Wilson joined forces to see Bourne to a seven wicket win. Results: Sleaford 171-9, Bourne 177-3; Lindum 151-9 (Tomlinson 52), Louth 136; Boston 241-8 (Lovelace 62, Sincuba 55), Grimsby Town 121 (Crossley 54); Bracebridge Heath 247-8 (Whapplington 68, Spence 54, Bennett 5-60), Alford 110; Woodhall Spa 171, Grantham 172-8; Spalding 214, Market Deeping 218-7 (Morgan 76).